Caprese meatball skewers are a perfect party appetizer. Paired with a spicy marinara sauce, they are so delicious and sure to be a crowd pleaser at any event you host. We do a lot of entertaining so I am always searching for delicious appetizer options to serve at parties and events. 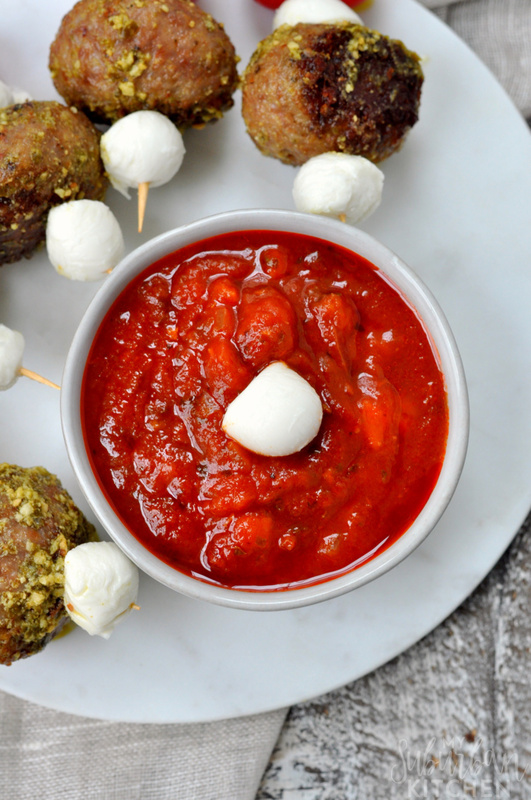 These Caprese meatball skewers are so perfect for any event and, especially when served alongside a spicy marinara dipping sauce, you won’t find a better option for your events. When choosing the meatballs to create these delicious Caprese meatball skewers, quality is so important. 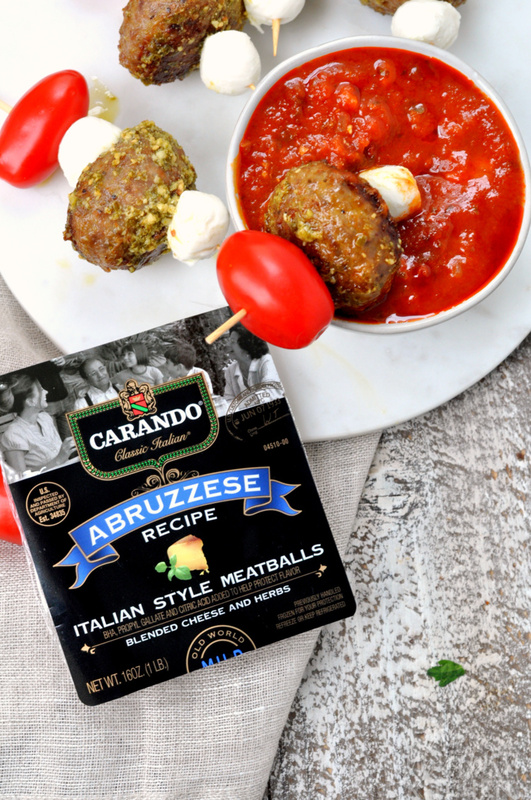 I use Carando® Abruzzese Fresh Italian Style meatballs found at my local Food Lion store. Our local Food Lion is super close and very convenient. I can always find what I need in one quick stop. 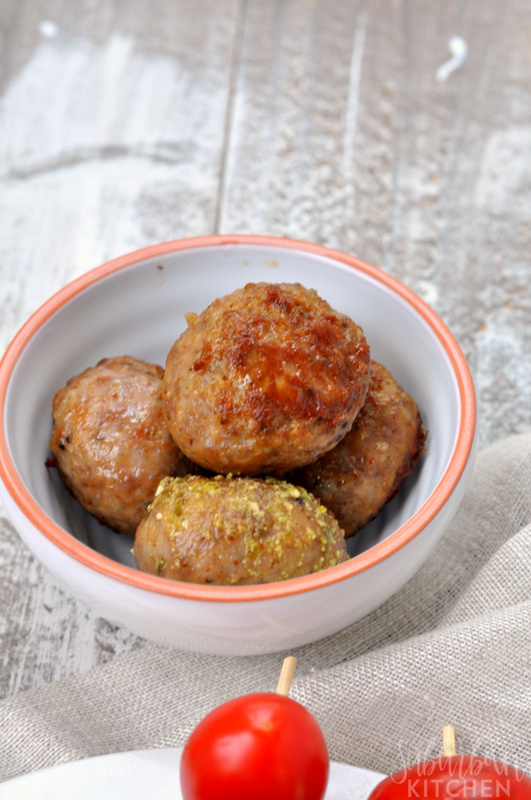 The Carando meatballs are blended with cheese and herbs for a flavor that can’t be matched. Theyare authentically crafted and deliciously convenient because all of the prep work is done for you. I use Carando meatballs in all of my favorite dishes, from pastas to appetizers. Once the meatballs are cooked, I combine them with fresh tomatoes and mozzarella for an easy appetizer. 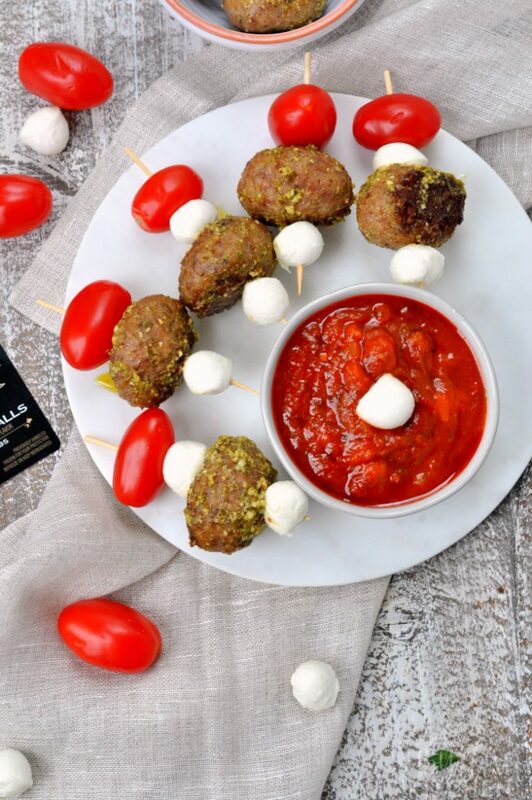 Pairing the Caprese meatball skewers with a spicy marinara dipping sauce makes for a delicious combination. You can easily pick up one from the store or make your own with fresh ingredients. Either way, the flavors work great together. I love using the Carando Abruzzese Fresh Italian Style meatballs for this holiday appetizer. The other flavors Carando offers include Mozzarella Rustica and Sicilian meatballs, which would be equally as good too. As the holiday season approaches, be sure to visit Food Lion to pick up all the ingredients you need to create these Caprese meatball skewers. When you shop Food Lion between 12/5-12/12/18, stop by the Entry Point Kiosk to receive savings on Carando meatballs (Offers will vary based on MVP rewards loyalty card). 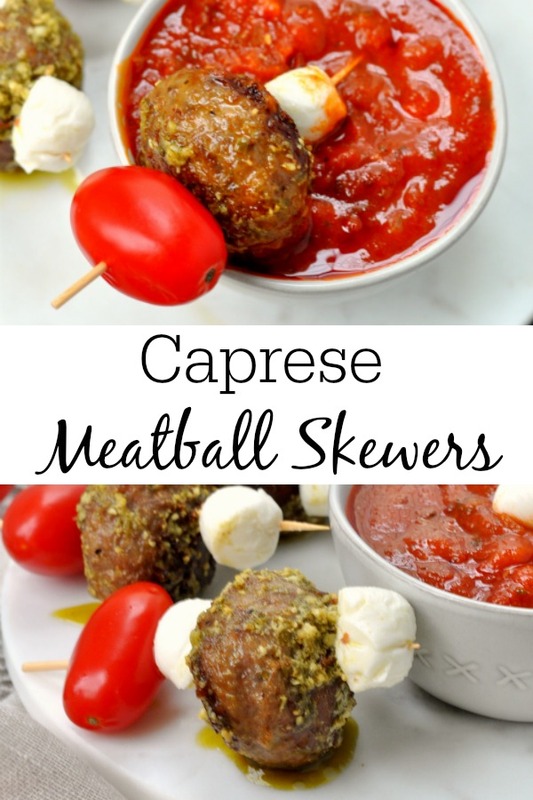 If you make these caprese meatball skewers or any other recipe from the blog, I’d love to hear about your experience. Let me know in the comments or snap a photo and tag it #MySuburbanKitchen on Instagram or Twitter. Caprese meatball skewers, paired with spicy marinara, are the perfect party appetizer for the holiday season and beyond. Heat oil over medium heat in large, oven-safe skillet. Add meatballs and brown on all sides. Transfer to skillet to oven and cook for an additional 7-10 minutes or until meatballs are fully cooked. Toss cooked meatballs in basil pesto sauce. 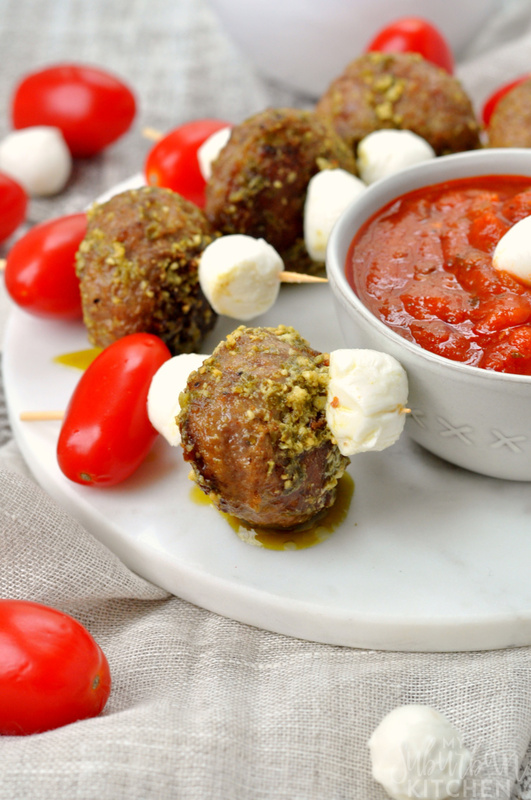 Create skewers by threading one tomato, one meatball and two mozzarella balls onto each. Serve with spicy marinara sauce for dipping. This is an awesome appetizer! I cannot wait to try it at our New Year party! Made these for a party and they came out really well! Love the cheesy, herby flavor of the meatballs. Very flavorful. Thank you so much for sharing! This is a perfect appetizer for any gathering. I wish those little meatballs are available in Australia too! What a fun idea, for a party or a family lunch! I will look for those meatballs in the store. This is such a perfect party appetizer!